Allow us to introduce to you the epitome of resto-mods. It began as a blank canvas and a brilliant concept. 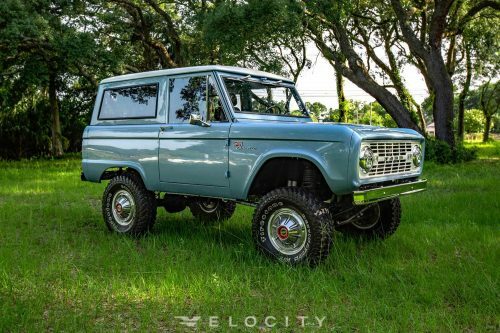 This 1969 early Ford Bronco has a 5.0-liter Coyote V8 crate engine that’s force-fed by a Whipple 2.9-liter supercharger and a 6-speed 6R80 transmission. And to exhale all that forced air is a custom 3-inch performance exhaust system. And as much as this Bronco terrorizes the streets, there’s so much more to it yet. JW Speaker LED headlights and Velocity Exclusive bumpers are blacked out, just like the PPG Custom Paint exterior and Method Wheels wrapped in Grabber tires. Our hand-built 6-point roll cage is powder-coated black and tied into the frame, complete with LED dome lighting. The interior finish is an echo of the exterior with high-end customizations and heated and cooled seats with diamond-stitched leather. It’s the most sinister-looking Early Ford Bronco we’ve ever built. In this video, we show you the importance of dyno tuning and walk you through our in-house tuning process. Watch as we strap our 1969 Supercharged Bronco to our chassis dyno and calibrate the positive displacement Blower to the Coyote EFI management system allowing us to increase power, ensure safety and improve fuel economy. The final results will amaze you! We pride ourselves on having equipment like a chassis dyno to set ourselves above the rest and guarantee you have the best driving Bronco you can buy.